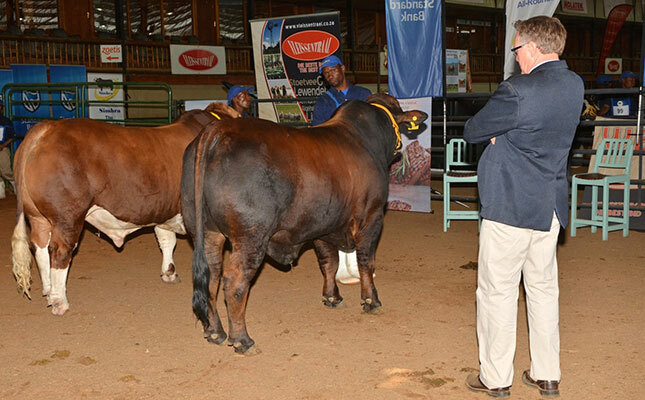 The showing of cattle is often used by stud breeders to market their animals. However, as genetic values become more prominent as a tool to improve the performance of herds, is there still a place for the showing of cattle? Show judge and breeder Llewellyn Angus investigates. 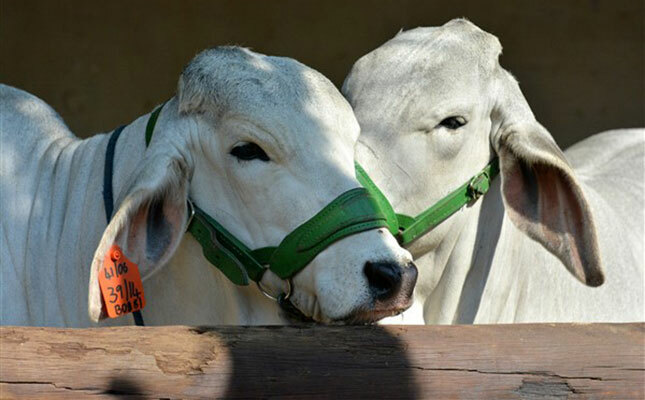 According to Llewellyn Angus, the Brahman breeders’ societies in South Africa and Namibia offer a good example of how breed societies can effectively combine the showing of animals with an equally important focus on genetics and scientific breeding. Showing or exhibiting animals to determine which the phenotypically ‘best’ animal is has been practiced for a long time. As many breeders will tell you, they enjoy farming with animals that offer visual appeal. However, these animals must earn money for their breeders. Breeders and buyers put an economic value on animals for two main reasons: their genetic or breeding value (what they can bring in financially in terms of production), as well as their appearance. An animal’s visual appeal is determined by its structural correctness and functional efficiency, as well as characteristics such as coat colour and shine, masculinity and muscle development, or femininity in the case of females. Estimated Breeding Values (EBVs), on the other hand, provide insight about an animal’s genetic value for certain genetic measurable traits such as birthweight, calving ease or weaning weight. A question that has long plagued the tradition of showing cattle is whether the best-looking animals, which are crowned winners at shows, are also economically the best to breed with. Phenotype, or what an animal looks like, is a combination of genotype and the environmental factors that the animal has been subjected to. From this point of view, one assumes that show cattle have been subjected to favourable environmental conditions so that they can be in the best possible condition. However, the ‘prettiest’ cow, economically speaking, is not necessarily the one with the most phenotypically correct appearance, but actually the one that weans a good calf each year under normal ranching conditions. There is no harm in participating in shows as a hobby, but if showing is part of your business of breeding productive and efficient cattle, then you could be mixing up your objectives. Breeders of certain breeds do still pay big money for show prize winners or champions, even if these animals have poor EBVs. But how much longer will this trend last? Show cattle, with their higher level of nutrition and hands-on management, cannot be compared directly with a large herd of cattle on the veld that are more often than not the animals that are actually making the money on the farm. They are, in effect, an isolated group of animals that are supposed to represent the ‘better’ animals that a particular breeder has to offer. But how do we define ‘better’? The expenses of showing, and the maintenance cost of show animals, can easily total R10 000 per animal per year or more. This is not to say that there are no benefits to showing cattle. Show animals are scrutinised by cattle judges, like me, to the finest detail for structural correctness, functional efficiency and breed characteristics. 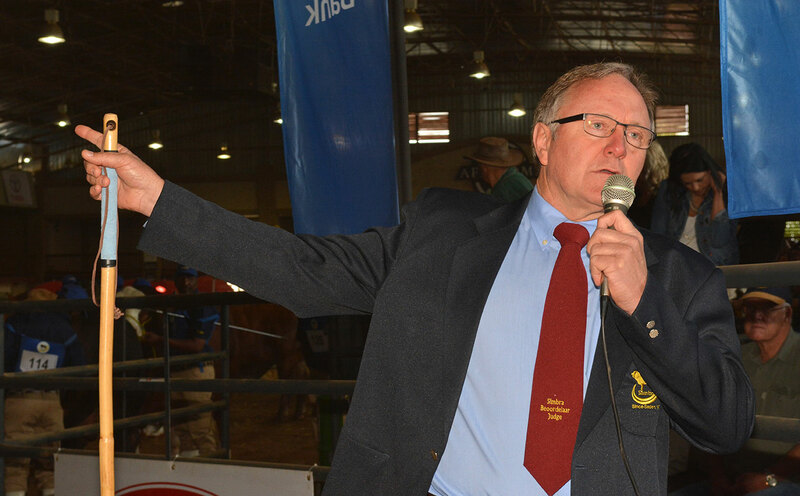 Llewellyn Angus is a registered animal scientist and a South African Interbreed Judges Association examiner. When judging bulls, a lot of emphasis is placed on overall masculinity, the scrotum and sheath, legs, which are an indicator of walking ability, and on muscling. When judging females, the animals are evaluated for their femininity, udders, whether they have the wedge-shape build and capacity to carry and birth a healthy calf, as well as their legs and walking ability. Through visual inspection, a show judge can determine whether an animal is coarse or fine-boned, large, rangy or podgy, whether it has good breadth and capacity, poor or good muscling in bulls, or too much definition of muscling depending on the breed. In addition, whether or not an animal adheres to breed characteristics can also be evaluated visually. Therefore, visual appraisal remains important for show and non-show animals when assessing cattle for structural faults and functional efficiency. The old saying “form follows function” still holds true. These days inspectors, who are usually judges as well, also consider the EBVs of stud animals during on-farm inspections. Where do ‘figures’ come in with show cattle? The animals are weighed and measured for traits such as birth weight and weaning weight, scrotum circumference, yearling weight, 600-day weight and hip height. Also, when judging cows over three years old, it is imperative to check the number of calves they have had and to discriminate against less fertile cows. As Dr Cliff Lamb from Texas A and M University puts it: “Females selected for breeding without the necessary fertility metric will have a negative impact on the herd’s overall fertility”. This also applies to show cattle. But a breeder might ask what happens if the management grouping of show cattle wasn’t done accurately. This may very well result in overblown actual weights and EBVs for growth. For this reason, the biggest problem presented by the smaller management groupings within which show cattle are measured and judged is the resulting lower accuracies of EBVs when compared with the larger farm cattle management groups. On-farm we can typically have 10 to 15 calves in a contemporary group, but with show cattle we may have only two or three animals in a group, which is insufficient for accurate performance testing. A possible solution will be to select animals for showing only after the yearling weights and scrotum size have been performed on the entire management group. Some examples where performance figures and visual assessment are already combined in the show ring include the Simmentaler, Simbra and some other breeds’ super-cow class, where cows only qualify if they have had at least three calvings, and where a Simdex (Simmentaler reproduction index) is combined with a visual assessment score to determine an overall winner. The existing Breedplan BLUP (best linear unbiased prediction) bull classes of various breeds, where certain EBV values are combined with a visual score, is a good example of crossover show classes. The Agricultural Research Council’s awards, as well as the South African Stud Book’s annual Phase C Performance Test Awards, are similar, where every breed society decides visually which bull of the qualifying bulls is the breed winner. These qualifying bulls have attained certain minimum performance criteria. According to international show judge, Dr Thomas Grupp of Bayern Fleckvieh Genetics, when judging show animals in events where performance figures are also taken into account, there must be a balance between the visual appraisal and the placing of animals based on performance test scores and EBV figures. Martin Seyfferdt, another show judge, agrees that if figures are available, they must be used, but there must be a balance between them and the visual appraisal. When buying bulls for breeding, though, one must first look at the figures to identify which animals’ breeding values will achieve the breeding objectives set for a particular herd. Only thereafter a visual appraisal of those bulls with the desirable breeding values is warranted. Ultimately, one must remember that certain attributes or qualities can be determined via visual appraisal, but others can only be determined by recording performance data resulting in EBVs. A breeder should make use of all the tools at his or her disposal when assessing animals. When looking at cattle breeds throughout the world that have placed the emphasis on showing, it is clear that those breeds have lost market share. 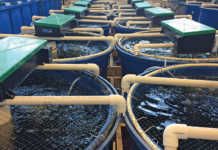 The breeders that have focused instead on improvement, based on the genetic trends of the whole breed, and on the whole breed’s good and bad attributes, gained market share. In South Africa, there are a number of breeds, including most of the synthetic cattle breeds such as the Bonsmara, that do not show at all, and this has not necessarily harmed their market share growth. 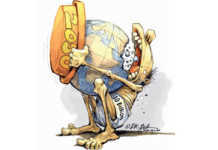 Breed statistics in South Africa actually show the opposite. Traditional showing does have its place in the industry, as long as participating breed societies and the commercial beef industry are aware that what is put on display in the show ring is only part of the whole story. Llewellyn Angus says although it is an honour for him to judge animals, traditional showing is only a part of the picture. “Plain economics will largely determine the future of cattle breeds and shows, and how they will evolve,” he says. Over time, due to economic and labour constraints, showing as we know it today will probably become less popular and only the bigger shows will survive, while open inspection days of animals on-farm, and young bull days, will become more popular. When breeders start paying less for traditional show winners, and more for phenotypically correct animals with the required EBVs, whether they be show-winning animals or not, the industry as a whole will be moving in the right direction. Visual assessment for structural correctness and other attributes will always be important, but stud breeders must remember that their bread and butter are the commercial breeders to whom they supply 90% or more of their stud bulls, and for these breeders, a bull must move the commercial herds forward in terms of performance. Breed societies should consider limiting showing in the conventional way, and instead pursue new ways to promote their breeds, including open inspection days, young bull days or non-halter showing. If a society chooses to continue showing, participating breeders should try to select show animals only after a year old so that all traits and weights up to then would be directly comparable in big management groups. When a society or breeders make showing their first priority, they are forgetting about balancing the breed and its objectives. No breed should be bred for the show ring, but for the farm. Contact details: Llewellyn Angus is a registered animal scientist and a South African Interbreed Judges Association examiner. He has won many awards for stud breeding and is a former president of the South African Simmentaler/Simbra Society. Email him at [email protected]. View the latest auction calendar.